DTrace and SystemTap are intended to trace applications written in native languages like C or C++ and dependent on compiler ABIs. If application requires virtual machine (in case it is interpreted or translated on-the-fly), virtual machine has to implement USDT probes so it can be traceable by DTrace or SystemTap. For example Zend PHP keeps call arguments in a global object, so you have to access that object to get arguments values instead of using arg0-argN syntax. Same works for Java Virtual Machine. 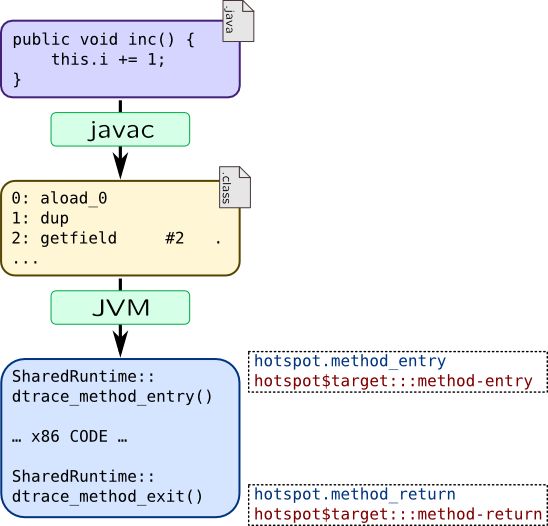 Oracle's implementation of JVM, called Hotspot and OpenJDK, which based on Hotspot support DTrace since version 1.6. It is available through hotspot and hotspot_jni providers. Latter is intended for tracing of Java Native Interface, so we leave it out of our scope. These options can be set dynamically for running virtual machine using jinfo tool. -Z option can also be helpful. Let's write small program, called Greeter which will write "Hello, DTrace" from four threads. Its implementation is based on Greeter from Solaris Internals wiki with small difference: Greeting.greet() method uses synchronized keyword so it will use monitor. Note that we are using copyin function to copy strings from userspace instead of copyinstr. That is because hotspot probes pass strings as non-null-terminated. Due to that, it will use additional argument to pass string length. You can see that when thread leaves Thread.sleep() method, it acquires monitor of Greeting object, calls Greeting.greet() method which will call PrintStream.println() method to output line. arg4 — is thread a daemon? is_daemon — is thread a daemon? arg3 — does class originate from shared archive? is_shared — does class originate from shared archive? arg0 — is this cycle full? In addition to provided probe arguments, SystemTap will supply name which will contain probe name, and probestr which keeps string with pre-formatted probe arguments. There are also several probes that are not documented: such as class-initialization-* and thread probes: thread-sleep-*, thread-yield. However, you can alter source code of jstack tapset to use other global events and use jstack() on live processes. That attempt will fail, but it will lead DTrace to extract required helper functions from Java process. You could notice that we can't extract method's arguments in method probes like we did it in other places via args array. That complicates Java application tracing. As you can remember from USDT description, in DTrace applications can register their probes within DTrace. This is also true for Java applications which can provide Java Statically Defined Tracing probes (JSDT). It is supported only in DTrace and only in BSD or Solaris. P.S. : Of course, DTrace and SystemTap are not the only option to trace Java. It provides JVMTI interface since Java 6 which allows to instrument Java applications as well. Most famous implementation of JVMTI is BTrace. Published under terms of CC-BY-NC-SA 3.0 license.